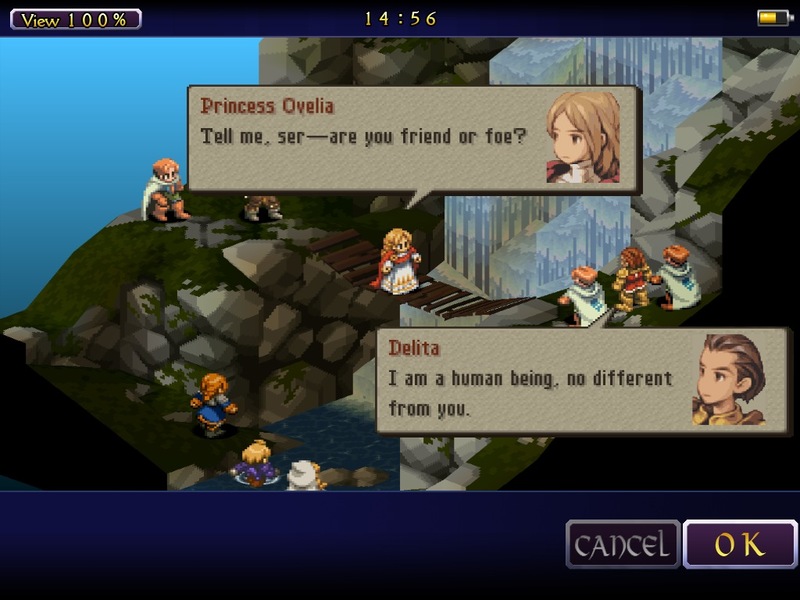 It’s been over six months since Final Fantasy Tactics [$15.99] hit the iOS scene, and while the port largely survived the move to the iPhone we noted some issues that kept the game back from a universal recommendation. Even worse, the iPad version that we thought was on the horizon disappeared from the radar, leaving the small screen as the only avenue for playing the game for quite some time (iPad 2x mode notwithstanding). Now with Final Fantasy Tactics for iPad [$17.99] here, we can finally see if that half a year waiting period was worth it. While the port certainly improves in a variety of different areas (mainly due to the increased screen space), it’s still far from perfect. 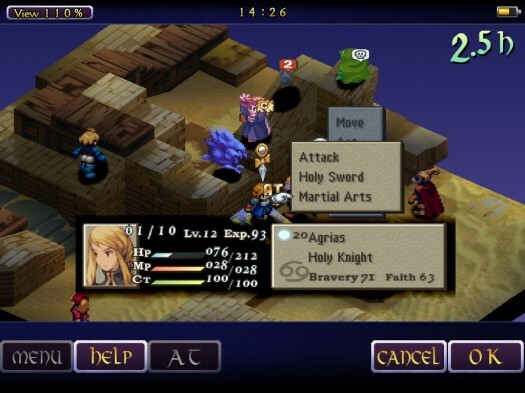 For folks new to Final Fantasy Tactics, I recommend that you read our original review of the iPhone version (along with the recommendation to just check around the internet for the multitude of views on this classic). For everyone else, this is the same War of the Lions version found on the iPhone/iPod touch and Sony PSP (except for the multiplayer in the PSP version). It’s still the same, extremely deep strategy RPG that has kept its appeal even over a decade later. One of our primary issues with the iPhone version of Final Fantasy Tactics dealt with an inherent limitation of the device. Specifically, the screen just felt too small for the amount of information displayed. Thankfully, the iPad version rectifies some of those concerns. The text is a lot less blurry (something that had been fixed in an update to the iPhone version since our original review), the added buttons and menus feel more spaced out, and the game just plays more comfortably in long gaming sessions. Unfortunately, the larger screen size also leads to a clearer view of just how pixelated most of the visuals are. However, I doubt most veterans of FFT are going to care about pixelated sprites. Gameplay slowdown, another nagging issue that detracted from the iPhone experience (and has been somewhat addressed in recent updates) has improved in the iPad port. Strangely enough, not all abilities/spells seem to benefit from the additional quickness. For example, jump into the prologue and you’ll see that Agrias’ Holy Sword abilities (as well as Summoner spells later on) are greatly sped up. However, Squire Fundaments, as well as some black mage spells, still seem to suffer from noticeable slowdown. This inconsistency seems to exist across a variety of abilities, although the slowdown seems to affect far less abilities than previously. It’s important to note that despite the speed improvements, there’s still a disappointing lack of smoothness which continues to detract from the experience. Gamers holding out hope that Final Fantasy Tactics for iPad features a revamping of controls are in for a disappointment. The touch controls, along with the general interface, continue to be a mixed-bag. The larger screen space of the iPad means things are generally easier to read and navigate, but there are still too many button presses, confirmation windows, and virtual buttons to be considered streamlined. Still, with enough playtime to get used to the controls I found the iPad version to be far preferable than the cramped iPhone/iPod touch screen. Other elements, like sound quality and music, make the transition to the iPad with little change. MIDI effects still continue to occasionally sound odd, most likely due to the porting process. 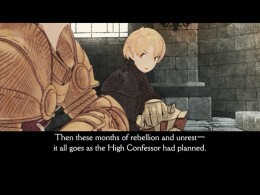 The music, meanwhile, is still one of the strongest suits of Final Fantasy Tactics, and remains one of my favorite gaming soundtracks to date. When all is said and done, the iPad port of Final Fantasy Tactics can be summed up in two statements. First, this iPad port, while long overdue, is superior to the iPhone version (primarily due to larger screen) and should be considered the preferred iOS experience (assuming you have an iPad 2). Second, while the iPad version makes improvements, it still doesn’t match the feel of the original PSX version, which has yet to be duplicated on any platform. For previous fans that haven’t checked Final Fantasy Tactics on iOS yet, your enjoyment will be based on how well you can check your nostalgia and overlook the nuances of porting. For everyone else, it’s safe to say that you should try this classic turn-based RPG any way you can, iOS or otherwise.